Institutional investors from the Middle East are about to dramatically increase their investment in European property, including Spain, a new report predicts. Middle East investors are expected to pour $180 billion into commercial real markets around the world in the next 10 years, with Europe slotted to receive 80 per cent of the funds, consultancy CBTE predicts. The U.K. will remain a favourite location, but an estimated $60 billion will flow to other European markets, with Germany and Italy as “key targets”, along with Spain’s hotel sector, which is now a “strategic destination,” CBRE forecasts. In contrast, Middle East funds have invested $45 billion in global real estate markets between 2007 and the end of 2013, CBRE reports. That’s seven times more than the Middle East funds invested in their own region, the consultancy notes. Middle East investors poured $20 billion into commercial real estate in the last two years alone, CBRE reports. While it is certainly not news that Middle East investors like European property, the report is interesting on many levels. For one, the volume of investment is staggering. But the focus on European real estate also reveals a reality of the choices offered to real estate investors. Despite the recent turmoil, Europe is still seen as a safer choice than other areas. Close to 90 per cent of all Middle Eastern commercial real estate investment outside of their home region in 2013 was in Europe, CBRE reports. But Middle East funds have not been focused on real estate. When compared to funds from Western countries and Asia, Middle East funds allocate the smallest share – about 9 per cent of the total portfolio — to alternative assets. 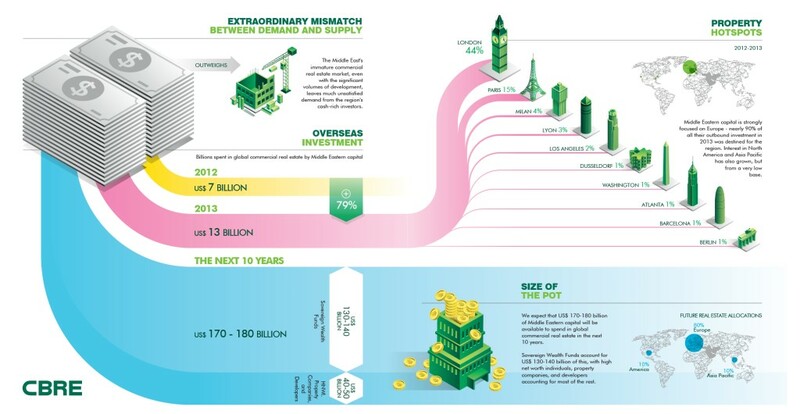 “A further increase in allocation by Middle East SWFs, even by a small fraction, represents an extremely large amount of capital that would have a significant impact on the global commercial real estate market,” CBRE says in the report. In general, Middle East investors tend to be conservative. They may pay top dollar for prized assets, but they are not looking to “flip,” CBRE says. Agreed. Spot on news once again, they seem to be investing for a secure retirement future. Only certain parts of Europe are a good investment for the future. Currently the UK and Germany are safe for investment, the South of France is historically good, leading Capital Cities and some islands like Balearics are fairly safe as supply and demand comes in to the equation then. However with the glut of homes in Spain and oversupply on the Costas, only the best addresses are ok. The article doesn’t mention anywhere that ‘ they seem to be investing for a secure retirement future’, that is piffle. As with all markets, check the transaction costs which in Spain are still way to high to make the run of the mill stuff a good investment!